While preparing for the next free knitting project (yes it’s coming .. and it will be exciting! ), thought I share some tips on how to wash hand knitted items. You may have either received hand knitted items (name it toys, sweater, cardigan, scarf, hat, the lists goes on..) as a gift from someone or even knit them yourself. They may be your favourite items, they may be new or has been there for a while and now catching dust. How would you go about washing them so they don’t break or loose their shape? Hand knitted items are precious as they may be unique and special, so you don’t want to risk ruining them. These few steps below will hopefully help you in caring for your hand knitted items. Before you wash any hand knitted products, try to find out information of the yarn used either by asking your friend who made the them / reading the labels which can be found in the yarn you purchased. This step is very important as each materials require different treatment. Some materials can be put in the washing machine, others need to be hand washed or even dry cleaned. Also don’t forget to find out what type of stuffing used when washing toys as some fillings cannot be machine washed. 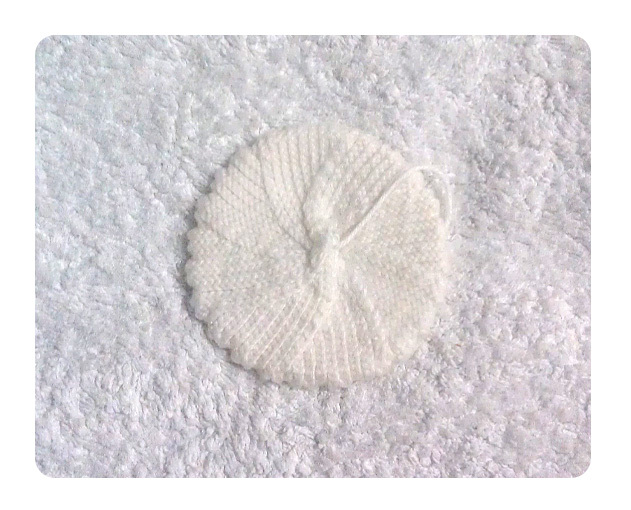 This tutorial will especially cover how to hand wash your knitted items safely. In this tutorial, I am using my knitted fried egg as an example. When knitting small toys, especially if they are light in colour you will sometimes find that the yarn get dirty easily. I personally found the beginning to be the hardest to knit and when I finished making it up, it tends to get a little dirty as I held that part of the yarn for a long period of time. Thus, i decided to wash my unfinished egg white to get it nice and clean. 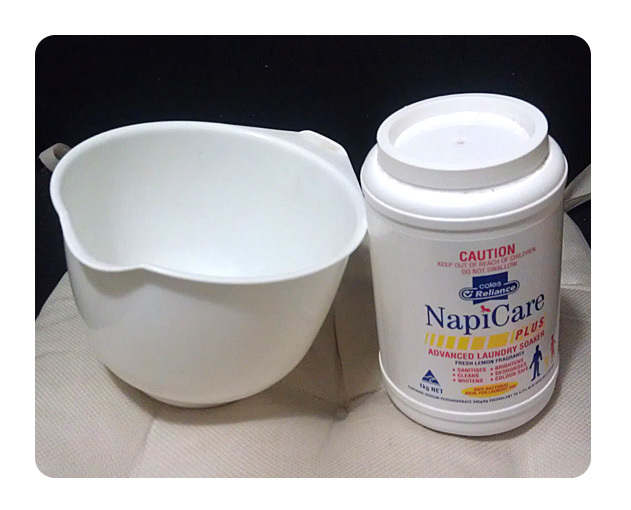 First up, you will need cleaning soap (I use Napisan and a tiny bit of Omo washing powder — they are great! ), a plastic container and some towels to dry. You first fill in the plastic container with cold water and put in your cleaning powder. Using cold water is the most safest method as some materials may felt or even shrink in warm water, so unless you know exactly what materials your knitted items are, cold water is the way to go. Also, ensure that you are using a lot of water for the materials to comfortably sit underwater. Mix them up until the powder fully dissolved. I used a plastic spoon to mix them up easily. By this stage you will notice that some bubbles has appeared in the water. Just before you soak the whole thing, always test a small patch of inconspicuous area for around 2 minutes to ensure that no colour bleed or anything undesirable happening to the item. 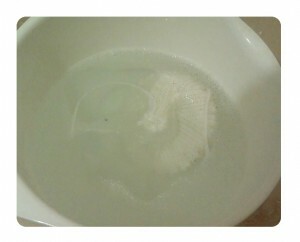 When all is fine, soak your knitted item and leave it for around 30 minutes. Some materials or dirt may take longer, it’s fine to soak them overnight if need be. Next is to gently pick up your hand knitted items and rinse it well. After rinsing, squeeze as much water as you can without wringing or twisting the item. as it will distort the shape! 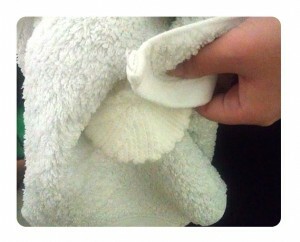 Gently placed the items on dry towel and pat it dry. Keep removing any excess water until no water drips. Locate a nicely air circulated room to allow the hand knitted item to dry (Do not place it under direct sunlight or use a hot blow dryer). 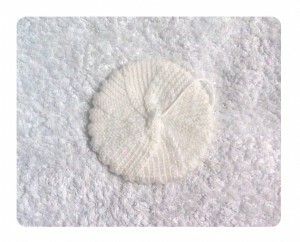 Shape the items to it’s original form and leave it flat to dry on top of the towel. If you have a fan, you may turn it on, but care not to place it too close and blow away our lovely hand knitted items.